Our "in house" guitar and bass specialist does guitar and bass set ups from basic to custom at an affordable price. We beat everyone's prices. We safely install rivets on your cymbals. If your cymbal cracks from the outer edge in, "STOP", do not play that cymbal. In most cases, an outer edge crack can be fixed by cutting a perfect circle all the way around the cymbal just past the cracks end. Then a new non-sharp edge is hand-crafted. 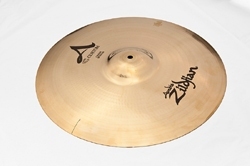 The cymbal in most cases will sound different than in its original size but still maintains much of its character. In some cases, the cymbal may sound even better. Although we can't give a guarantee on the extended life of the cymbal, in most cases the cymbals will last forever with normal use. With the high price of cymbals these days, it's a great way to get more life out of your original purchase. Bright Way Cymbal Polishing is an innovative and safe method created by Dan Lucas, Doug Maclaroy and David Demeter. The cymbal logo can be protected or the logo can be safely removed, your choice. This is a secret process but we guarantee your cymbals will be restored to that new look and true sound. The only professional way to clean a cymbal. Exclusively at The Drum Lab. Copyright © 2010 - 2019 The Drum Lab. All rights reserved.